Miles’ father goes to the detention area while the whole city is in chaos. Meanwhile, Spider-Man has invaded The Triskelion and looks foward to join the Ultimates. For the most part the art was good especially in the more frantic and action paced scenes. It was also cool seeing Miles join the ultimates! Talk about going from zero to a hundred over night! The story especially the parts with Miles father conveyed the panic and absolute terror going on in the streets of Ultimate 1610 America. On the other hand this issue the art felt rushed. It wasn’t as smooth or as refined as it usually is and some panels were just plain ugly. What was up with Captain America’s body having a new shape every panel? 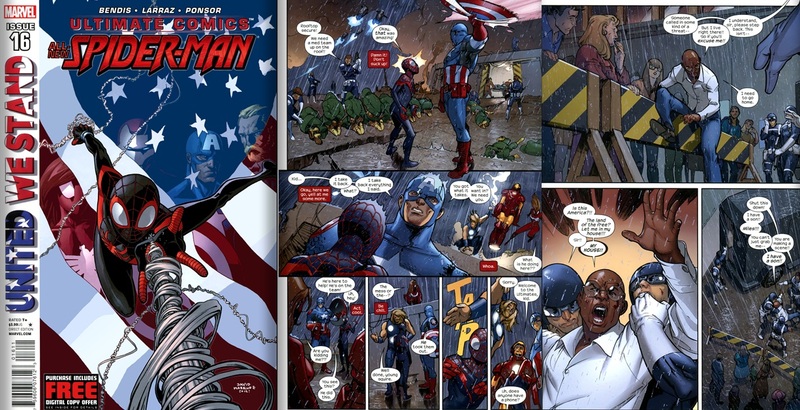 With the nation at war, young Spider-Man heeds the call of Super Hero duty! 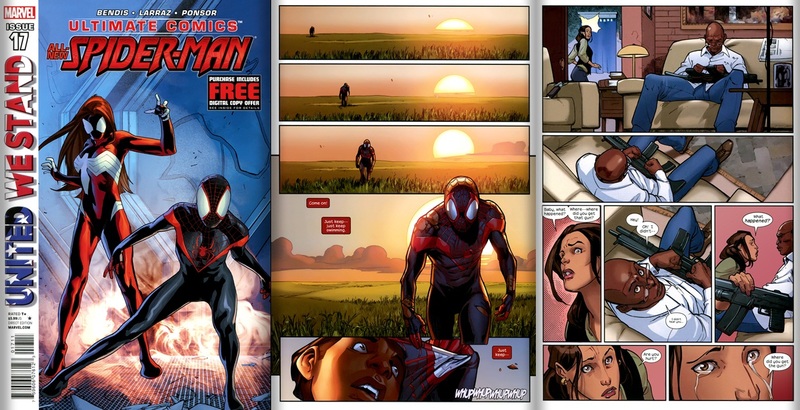 The secret connection between Miles Morales and Spider-Woman revealed? Slight improvement in art for this issue, great action sequences though a mistake was made on page twenty where Spider-woman is the size of a small building and Miles looks like an ant. I was unaware she was using Pym particles. This issue felt like filler honestly it lacked the emotional resonate of earlier issues. Miles father comes out the real star of the book with his experience with Hydra and Shield being the most gripping. Also, I hated the cover art! The world is at war and Miles Morales is miles from home! Miles has joined the Ultimates but that decision may have cost him his family. Our young super hero has to make some big decisions and he has to make them now! Thank God the regular artist is back! As a result the interior art was sharper, prettier and slicker all around. You never truly appreciate the art on a book until you realize that the greatest stories have a good story perfectly executed by an artist. This issue finds Spider-man now christened the man who saved the president returning home thanks to Spider-woman after defeating a terrorist. He shares a heartwarming reunion with his parents. Said parents also had a touching moment themselves as the father told the mother his own ordeal with being captured, witnessing a murder then his escape. Thank God the crossover is done and we can get back to the normal everyday adventures of Miles Morales in his friendly neighborhood.